Sometimes I use the “Suggested Records” at Ancestry.com because sometimes some of them are helpful. 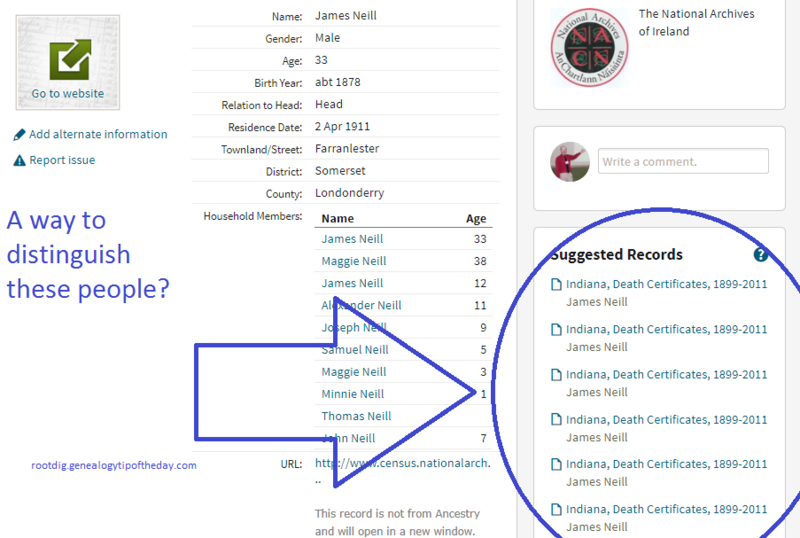 And then there are times like this when the “Suggested Records” are virtually impossible to navigate–like this result for James Neill who was living in Ireland in 1911. There is not enough detail so that I can tell which ones I have looked at–and there are more on the page for this item than shown in the illustration. I have to hope that they sort in the same way on every page where they are shown. I wish I could mark the ones that I had looked at. I can link records to specific individuals in my tree. Why can’t I indicate which records I have already seen so that a little mark shows up on the “Suggested Records” list? Just a little suggestion that would improve my customer experience.